Poppy reigns as the Matriarch of the Britisher line, she has given me beautiful puppies, she is the mother to Archie and Queenie, Grand mother to Jack and Trinity and Great Grand mother to Arthur, Horatio, Holly, Geraldine and Wendy and Great Grandmother to the rest of my dogs. 30.12.2008 - a day I will ever forget. Poppy had a big Fan club and many have asked what has happened to her? It was and still is very difficult to deal with. Poppy was tragically taken away from me on that day. Poppy was pregnant and when the time came to give birt,upon arrival to our vets practice Ancare Veterinary Surgery in Canterbury we found a substitute vet present called Claire Vaughan, as our usual vet was away attending to an ill relative. 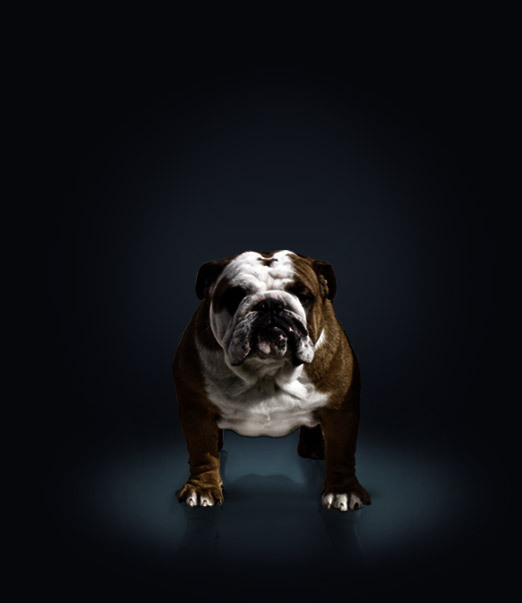 I felt uneasy been faced with a new vet and asked Claire Vaughan if she had experience in bulldog c-section and anesthetic?
" you are in safe hands, I have done many! ". Poppy happily wagging her tail walked into the operation room and 5 minutes after, the vet had stopped her heart and was not able to recover Poppy. Poppy was not even prepared for the c-section, all the vet Claire Vaughan did was to put her on the table shave her paw and stop her heart!! Claire Vaughan did not even try and save the six puppies that Poppy was carrying. When faced with dead Poppy on the table I and my partner began to question her and reluctantly Claire Vaughan admitted that she never have done an operation on a bulldog before! When faced with questions why she did lie about the fact when asked about her experience with bulldog c-section and anasthesics, Claire Vaughan who stood with her arms folded all the time in a nonchalant way stated : "I was confident I could do it". Claire Vaughan is a disgrace to the veterinary surgeons occupation this person is a walking shamble. By lying into my face she had taken away from me the liberty of choice. If she has told me the truth when I first asked I would have taken Poppy somewhere else and NEVER let her touch my girl. I would like to thank all who has contacted me and shown sympathy and concern regarding Poppy's death, it is much appreciated. Bryan of Unstopabull | Miquel Sanchez of SanSimon Bulls, Peru |Macello Mequita of Macm, Brazil | Luca Bisignano of Old England's Dream, Italy | Lucia of Fortunecity, Brazil | Avi, Pneimallach, Israel | Jackie of Jamicic | Jeanette of Bandapart | Enrika Walker of Britishus | Charmaine of Exkas, Malta | John of Smackerjack | Dave of Bexbull | Sarie of Heavybulls, Sweden | Salvatore of Iblabulldogs, Italy | Giani Vullo of Lorodelpiana, Italy | Ingridh of Layback, Sweden | Sissy of Soulguardian, Greece | Szilard of Vortigern, Hungary | Joanne of Deandra, Malta | Pat and Nella of Nellas, Malta | Kirsty and Jim of Joelee, N.Ireland | Ann of Cholto | Maria and Ralph of Hillplace | Gina of Robobull | Britta of Goldbullies , Sweden | Samul Zimmer of Brazil | Linda Mills of Somyway | Karen Downes of Englishpride | Inger of Multums , Sweden | Sara of LaRoyal | Alex of Big Bulls, Germany | Constanze of Jabberwocky's, Germany | Natasha of Radinkas, Holland |Steve of Bulltannia | Katja of Imperator, Germany | Angie Rachel | Tony & Maureen Javicjo Bulldogs | Debbie Walton of Kavidas, Denmark | Angelo Ciliberti, Italy | Marijan of Frankies Gang, Croatia | Anna of Pretty Ugly, Sweden | Duncan and Allie Newton of Fortebello | Chris and Kara of Englishglory | Michelle of Albertwood | Carol of Wencar | Paula Hunt of Retrodaze| Meri of Remington, USA | Tina of Sakazoke | Penny of Macrite | Brett and Leanne of Britishicon | Terrie and Charlee of Rokoluck | Pia Karlsson of Agaton, Sweden | Bex and AJ , Ashford | Alan of Aldanat, N.Ireland | Joao of Tucky, Brazil | Tobbe of Mazziveredz, Sweden | Monique of Mojos, Holland | Natasja of Mr D, Holland | Gem and Craig of Loxstarz | Charlotte of Dieselbulls, Denmark | Bill and Anne of Ringablok |. KAREN CHAMBERLAIN of Maverick Bulldogs who was with us at the vet's when Poppy died.